“I started with mixed feelings of uncertainty, worry, anxiety,” the newscaster and new mother reveals. 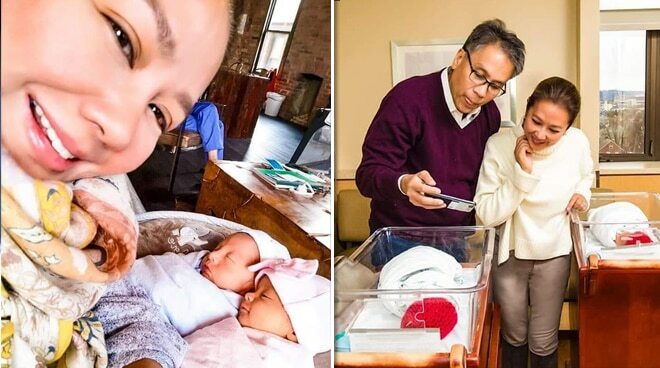 It came as a shock to many when newscaster Korina Sanchez and her husband, politician Mar Roxas, introduced their baby twins Pepe and Pilar into the world last week. On February 12, at around 1PM, the couple welcomed their children — a boy and a girl — at a hospital in Pittsburgh. Talking to PhilStar recently, Korina confessed that she had always wanted to start a family with Mar. In fact, it is something that she and her husband have worked on for several years before finally conceiving in 2018. “I’ve always, always wanted to be a mom. Everyone who knows me well knows that I love children. But for the longest time, because my career in news took charge, I thought it would never happen. But now that it has happened at my age, and even if we had planned and started on this project years ago, I started with mixed feelings of uncertainty, worry, anxiety,” she said. “I felt weird feeling that way. I worry about the future, about everything that could go wrong. I’m told this is normal among many expecting and new mothers. Good to know I’m not weird. It wasn’t instant with me. The joy crept up and slowly but surely took over. Now, every day is even more joyful than the day before. I’m very hopeful about the future. I have renewed energy, I don’t know how that happens, It’s adrenaline I suppose. I might be acting younger. And maybe I’ll live to be 120 years old,” she exclaimed. Korina revealed that they had their embryos freezed “before my biological clock stopped ticking”. They were only waiting for the perfect opportunity to start a family, she said, but would always be swamped with work in their respective careers. “After 2016, Mar and I embarked on our best life adventures. Things we’ve always wanted to do, but couldn’t because of work, we did. We didn’t think Mar would run again for office. So we both said, now is the best and only time. If we waited longer, it would be too late for us. This is also why Mar found it so difficult to decide to run again,” she said. “But public service beckons,” she added. Hey guys! Wow, thanks so so much for the overwhelming response to my question about what to name our twins! Hahaha, grabe! May nakakatuwa (Anthony and Cleopatra? Ano sila, sinaunang loveteam?). May banal (Joseph and Mary...hmmm, baka di ko na sila mapapagalitan?). May nakakatawa (Mahal and Mura? Really? Naman.) may creative (MariKor and Korimar --- not so creative yata...). Tawa kami nang tawa ni husband habang nagbabasa ng suggestions ninyo. Pero nakapili na kami sa wakas ng names nila. I think matutuwa din kayo. Manood ng TVPatrol mamaya ha? Doon ipapakita ko na ang mga faces ng mga angels ko! Kasi ang daming humahanap na ng pictures nila! And of course the big reveal! Ano ang name na itatawag namin sa kanila! TV Patrol mamayang Gabi!💚💋 Am so excited to share! According to Korina, she and Mar couldn’t have chosen a better surrogate. “She wanted to help us as she had helped another couple in the past. Intelligent, compassionate, kind and responsible. Being how she is, we felt no reason to micromanage her with her food intake or activities. We wanted to respect her privacy and how she would be responsible for the children. We of course kept in touch the entire time and exchanged developments regularly,” she said. Currently, Korina is still in the US to wait for the papers of the twins so they could fly home as a family. “And they have to be strong and stable enough for the long flight home. So maybe in less than a month we will be back. Mar had to leave because of the demands of the campaign but will be back before we head for home,” she said.